DJ Jam has been touring the world since the early 90’s as the official DJ for Snoop Dogg, Dr. Dre and the infamous Death Row Records. He is hands down Cali’s #1 party rocker and has been reppin’ the Westcoast sound like no other before or after him. In addition to rockin' as Snoop’s DJ, Jam as also smashed the decks for the Dogg Pound (Daz & Kurupt), Warren G and the late great Nate Dogg. You don’t want to miss DJ Jam tear down Club 9ONE9 at the concert afterparty because there ain’t no party like a Westcoast Party when DJ Jam is on the set! For real. Born in the East, but raised in the West, DJ JAM got his inspiration to be a DJ when he was only 13 years old. JAM’s brother-in-law bought him his first turntables and mixer from a friend who was visiting from NYC. JAM had experimented with playing the trumpet, drums, keyboard and guitar throughout his elementary, middle and high school years. Now he had a new instrument to learn: 2 turntables and a mixer. JAM continued to practice his skills in his bedroom until, after playing many house parties for free, he was offered his first paying DJ gig. When he was 15, JAM became a “professional” when he was paid $50 to DJ at a high school house party. At 16, JAM was ready for the club and college scene, and was spinning on commercial radio in San Diego by the time he was 18. When he was 19, JAM displayed his skills as a battle DJ and advanced to the DMC US Championship. JAM quickly gained status as “the” DJ of the San Diego area. In 1989, JAM met Snoop through Kurupt and mutual friend EL Dogg (RIP). A few months later, JAM hooked up with DR DRE whom he met through the infamous Chris “The Glove” Taylor (DJ For ICE T in the movie BREAKIN). Both Dre and Snoop approached JAM to be their tour DJ within months of each other….the rest is history in the making. DJ JAM is hailed for his style, creativity and ever-growing list of achievements. He participated in the DMC finals and remixed Dr. Dre and Snoop Dogg’s “G-Thang” on the Double-Platinum album, Death Row’s Greatest Hits. His unparalleled sound has been heard at movie premieres, album release, and private parties. His skills have been called on by various entertainers, industry executives, and television shows both in the US and abroad. JAM has appeared on countless shows, including: David Letterman, Jay Leno, Conan O’Brien, Ellen Degeneres, the Ryan Seacrest show, Arsenio Hall Show, The Chris Rock Show, Showtime at the Apollo, Pepsi Smash, VHI, MTV’s TRL, Direct Effect and Snoop Dogg’s Doggy Fizzle Televizzle, BET’s Rap City, 106th and Park, as well as the MTV and BET Awards, Vibe awards, Source Awards, American Music Awards & more. JAM’s remixes and production work are as diverse as the artists he has worked with; Snoop Dogg, Dr. Dre, Notorious B.I.G., Bobby Brown and Chaunte Moore, to name a few. He is also responsible for discovering BOW WOW in Columbus Ohio back in 1993. Closer to home, as the mix show coordinator at KKBT-FM Los Angeles, JAM’s strong influence was felt as part of the team that took the station to number one for the first time. His exclusive mixes were featured Monday through Saturday on various shows and mix shows. He also joined Superadio Syndication Network where he is the man behind many of the mixes that are heard on stations all over the country. He left KKBT/LA to join the KPWR/LA mixstaff and was featured with Snoop on Dogg House Radio. Two years later, JAM and Snoop went back to KKBT and JAM was featured with Snoop on the Nationally Syndicated Bigg Snoop Dogg Radio Show. Whether your musical taste is Hip Hop, R&B, Reggae, House/Electro/BMore Mashups, Funk or Soul Classics, JAM has covered them all. He is a constant and infamous fixture in radio, clubs, and as a tour DJ. 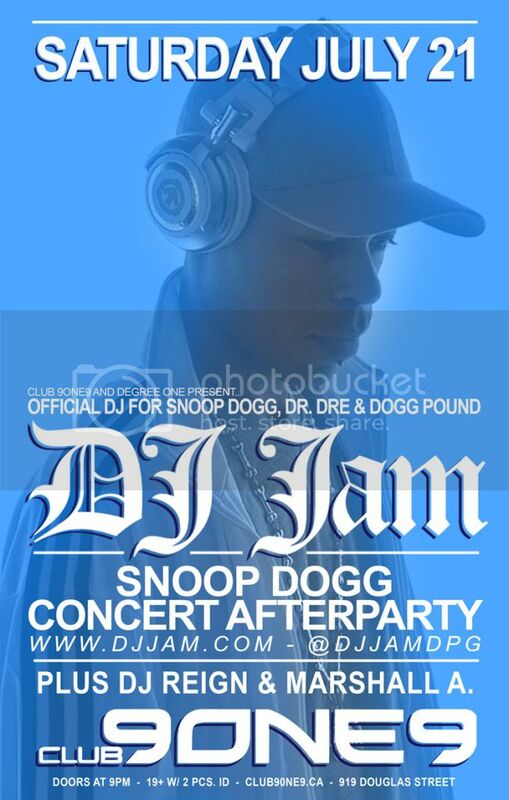 JAM was the DJ since the first CHRONIC tour which featured; Snoop Dogg, Dr Dre, Nate Dogg, and The Dogg Pound. JAM has been the man behind the decks for Snoop on various Tours such as Snoop and Diddy European Tour, Good Vibes Tour (Australia), West Coast OG’s (Snoop Dogg/DoggPound/Ice Cube WC- CANADA), How the West Was Won Tour (Snoop/Game-CANADA), Project Revolution Tour during the summer of 2004 (which featured Linkin Park, Korn, Snoop Dogg and The Used) & more. He was also the man behind the decks for Dre’s legendary Up In Smoke Tour. This sold-out arena tour, which included 47 cities and 25 after-parties hosted by JAM, featured artists such as Eminem, Ice Cube, Warren G, Snoop Dogg, Dr. Dre, Kurupt, and Nate Dogg. In addition, JAM is also the DJ for the 213 Crew (Snoop, Warren G and Nate Dogg) and was the DJ for Snoops platinum selling Eastsidaz Crew (Snoop, Tray Dee and Goldie Loc), Warren G , Doggy’s Angels, No Limits C-Murder and the bay areas Whoridaz. JAM’s busy travel schedule proves just how highly sought after his talents are.